We visited Center Parcs for the first time ever. My wife, I and our 16 month old son in tow, we had a four bedroom lodge to accommodate us and 2 couples and their baby each. Even though it was 3 couples and 3 babies in total, we had to book a four bedroom lodge as a three bed was not allowed for health and safety reasons. We had lodge number 25 in Lake Beck, a very nice lodge with 2 car loading spaces in front of it, quite close to the bins on the main path for us to dispose nappies! The living area was big, couch that would easily site 5 people along with 2 single seater sofas. Was pretty impressed with the large 8 seater dinning table. The kitchen was open plan type with lots of crockery and cutlery provided. The 4 bedrooms were quite small, 2 double bed and 2 twin beds, one room with a tv.we all had brought our own travel cot however they do provide a wooded cot in the dinning area. Our cots just managed to fit into the bedrooms, I can say the one they provide will not really fit into any of the bedrooms. There was a hoover provided, iron, board, hair dryers and towels. Watch me unbox my new toy that I’ll be replacing the BT Homehub 5 with. If ypu need help configuring this to work with BT Infinity please check out my other page. I had bought the Dual Band Asus DSL-AC68U AC1900 modem/ router to replace the BT Homehub 5 on BT Infinity fibre broadband, I was getting pretty bad dropouts and signal degradation through some bits of the house. I had a nightmare of a time trying to get the router connected to the Internet and, in the end I managed to successfully connect it to BT Infinity 1. You could go through the quick setup option but you’d still have to click the manage settings option to configure further settings. 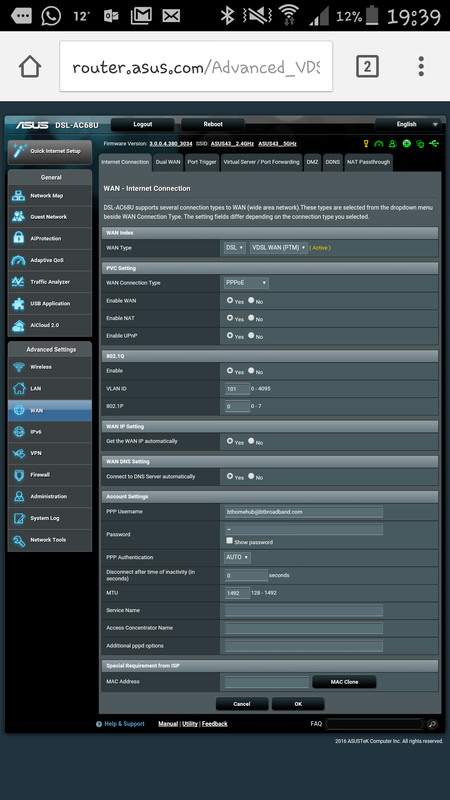 Quick setup option I choose was BT Infinity no vlan. Here are the settings I used to successfully connect to BT Infinity. The most important setting to get it connecting was VLAN ID = 101 and ensure you enable 802.1q. 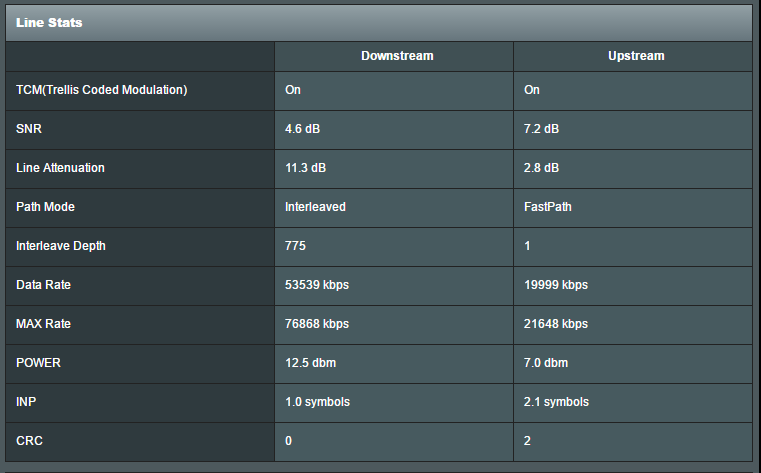 The DSL Settings that I used that gave pretty good performance. 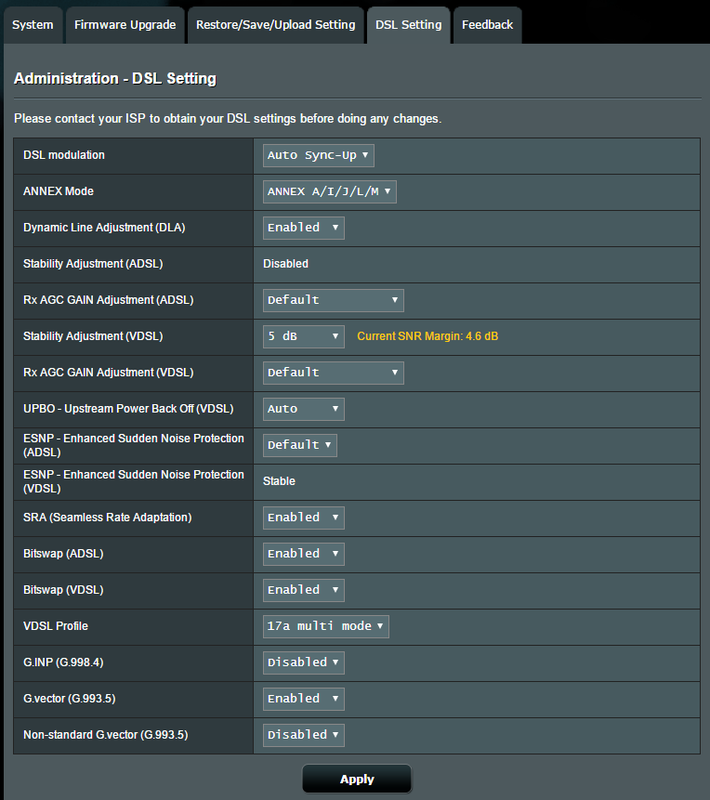 Please Enable G.INP (G.998.4) – BT have implemented that on some cabinets apparently! I managed to get an extra 3Mb on my download data rate. With our recent baby, we found ourselves washing his chew toys and food bowls quite a lot and needed a clean surface to dry them. I came across this product by accident on Amazon and I thought it was an amazing idea. I bought it to try and it made an amazing difference on the kitchen table, it looks the very pleasant on the eye and it’s very easy to use. It comes in two parts, the tray to hold the water and the “grass”, which are plastic spikes that are spaced apart unevenly so that you’ll find a space suitable for whatever size of object “stab” in. I find the grass really useful, keeps the baby stuff hygienic and away from your other everyday items. The grass is easy to clean too, a dunk into the wash basin with antibacterial washing up liquid and that’s really about it. 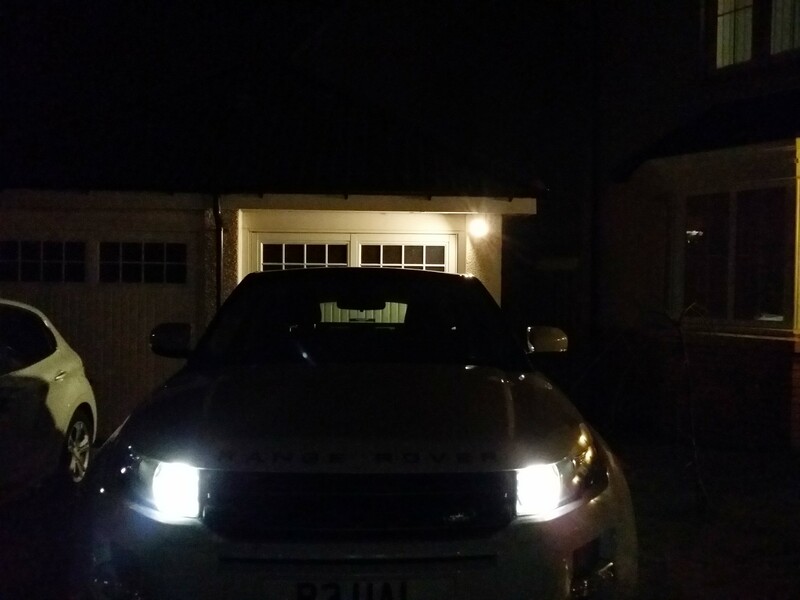 I recently upgraded my headlights on my car from the standard Osram bulbs to Osram’s Night Breaker Unlimited. Here is a picture showing the difference between Osram standard vs Osram Night Breaker. The Night Breaker is fitted on the right-hand side on the car (left-hand side looking at the photo!). This weekend I put up the wallpaper for the nursery. Quite to our surprise there was not much nursery themed wallpapers that were easy to get. We’ve been to B&Q, Homebase & Mothercare – all of which have a very limited range. 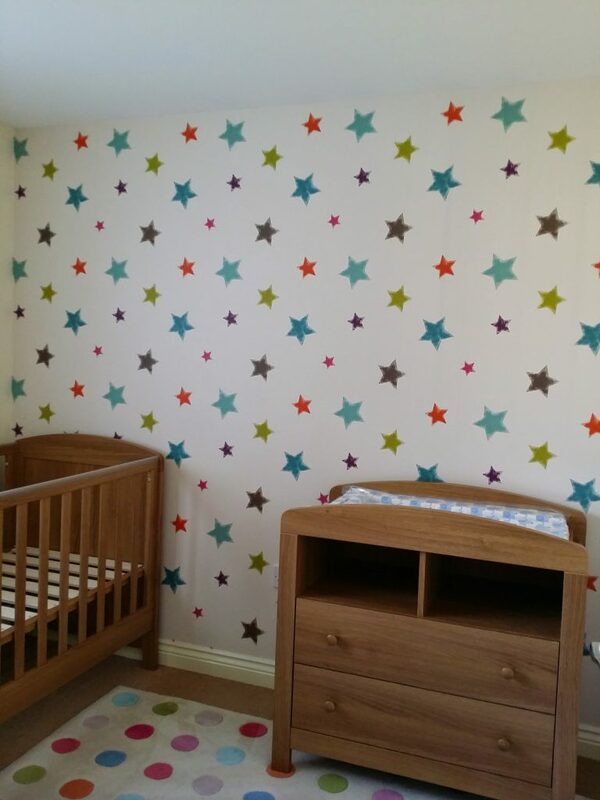 We finally settled on Timbuktales from Mamas &Papas, it is a white background based wallpaper with large coloured stars on it. I’ve noticed it is quite difficult to find a decent photo to see if the colour of furniture goes with the Timbuktales wallpaper. 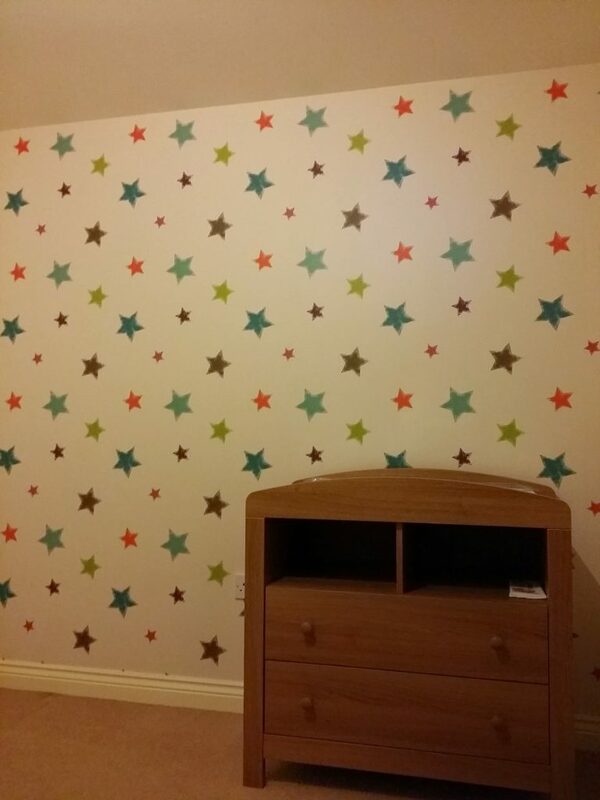 Here are some photos of the wallpaper with our Mothercare Padstow furniture. 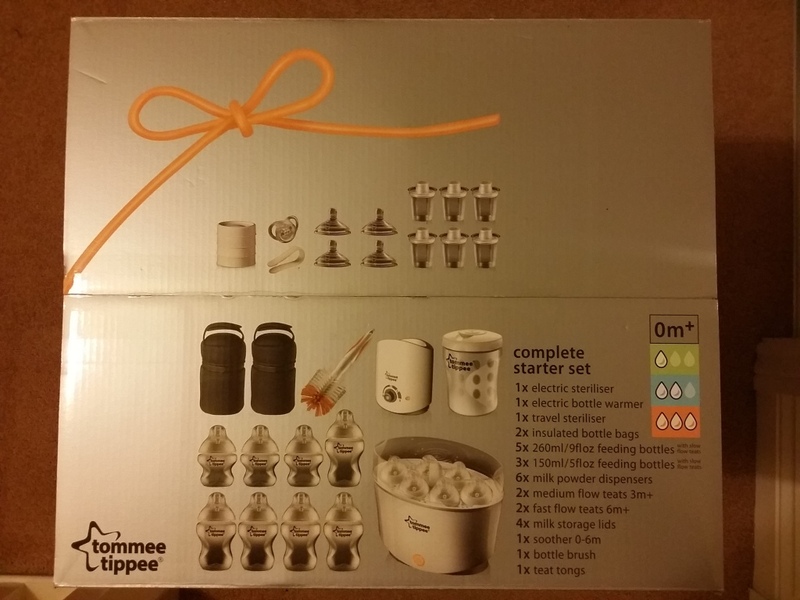 In this post I compare the differences between the Tommee Tippee Closer to Nature Complete Starter and the Essentials Starter Set. 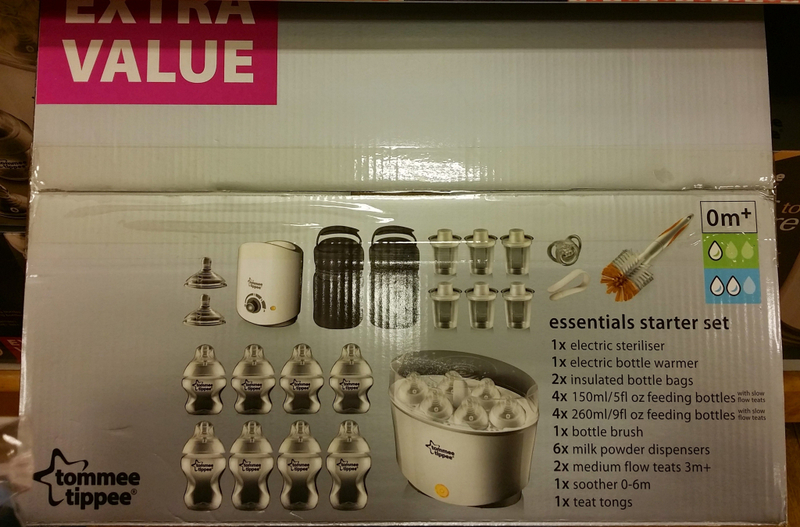 Here is the Complete Starter Set which I have purchased over the Essentials Set. I’ll explain the differences in detail below. Differences between Complete Starter and Essentials Starter Set in detail. I’ve tried to highlight the differences using orange and red colour coding. I’ve shown amber when an item in the set has a lower quantity and red where the item is not in the set at all. I hope people find this useful! I do not really understand the pricing between these two sets as the Complete set seems to have more items than the Essentials set. However the Complete set is priced lower than the Essentials…?! I recently purchased a Windows tablet to play about with considering it only costed me £59.00 from Tesco (Boxing day sales down from £99.00). Here is my video showing you the tablet itself and what you get in the box. I plan to do a more hands on review against my Nexus 7 once I play about with it a little more. As a bonus, the video here shows me comparing the Connect 7’s size against my Nexus 7 very briefly. I recently received the Amazon Fire TV as a Christmas present, please watch my YouTube video of the unboxing of it. We visited Paris recently in August and we stayed in this little boutique called Hotel Saint Dominique on 62 Rue Saint-Dominique. It’s located within the 7th arrondissement of Paris and you could actually see a bit of the Eiffel Tower from outside the hotel. 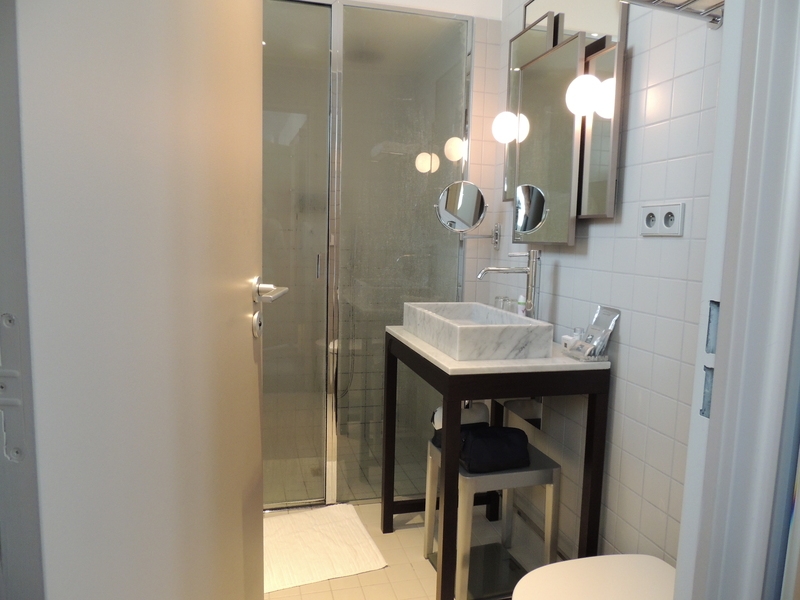 In fact, we loved the location, 10-15 minutes walk to the Eiffel Tower and it was only a few minutes away to the nearest metro station. 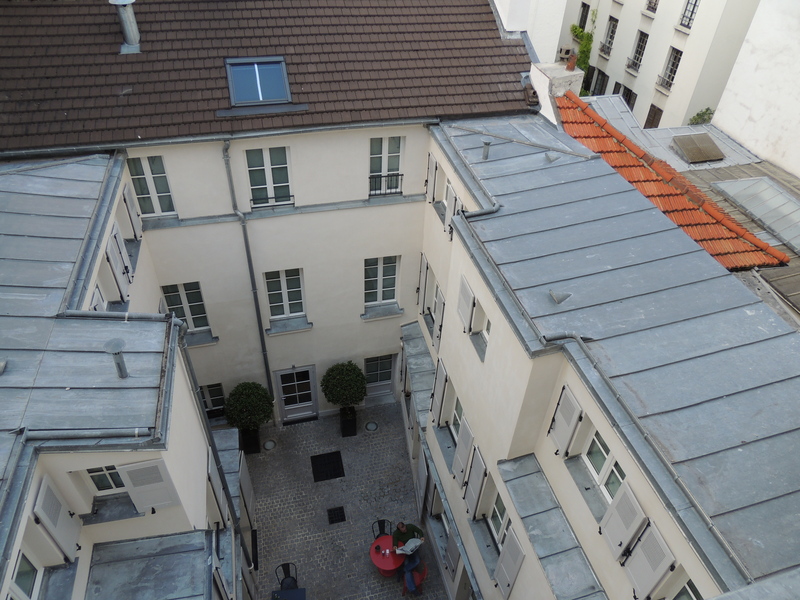 We had a room on the fourth floor at the back of the hotel looking out onto the courtyard. It was probably better that way because the front of the hotel is on a relatively busy road so it meant it was a bit quieter during the night. 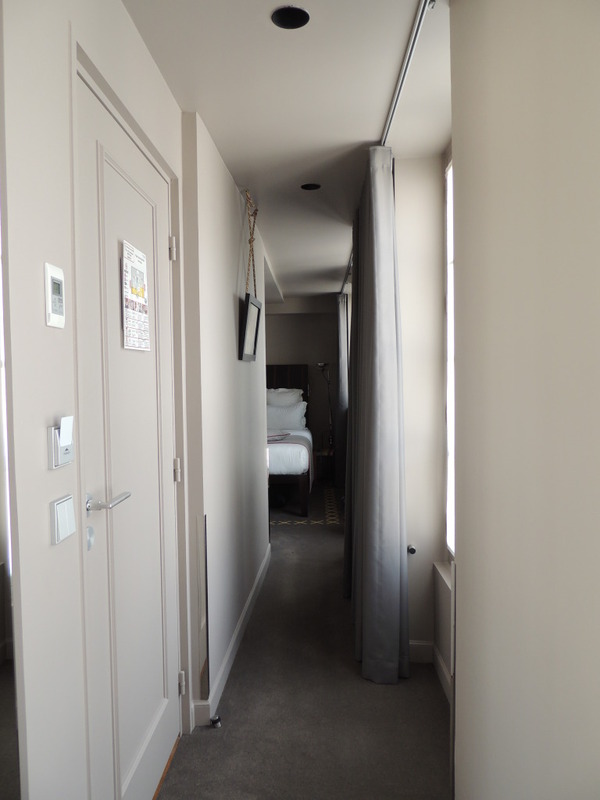 As I said at the beginning, the hotel is pretty small but I guess its like that for most Parisian hotels. The room we had was a strange shape, it had a long hallway which adjoins the bedroom on one end and the bathroom at the other. We had to unpack the suitcases because the bedroom was pretty small. So the suitcases went under the bed and we lived out of the wardrobe. This wasn’t a problem, the wardrobe had plenty of space for the week we stayed for. The room had a pod type coffee machine which we used a few times, they do resupply the pods everyday. 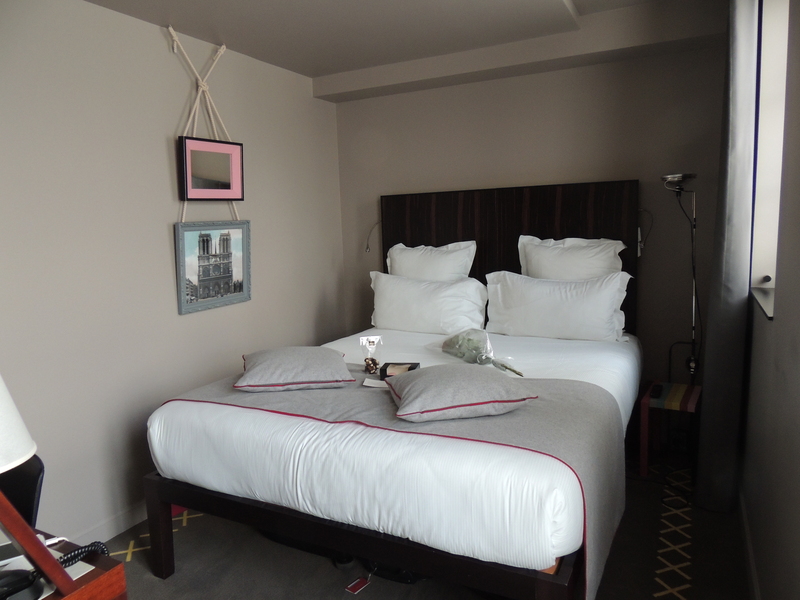 Overall, my wife and I totally loved the hotel. The staff were nice and helpful when we need directions. Every morning on the way out the hotel the receptionist would ask us if we were heading out for the day, so that they could do house keeping.